Another submission from contributor, Jeremy D., in Springfield, Oregon, this Fred Meyer" marquee is proof that the lowercase L phenomenon can manifest itself in formats other than handwriting. While it is unclear whether the sign master had run out of uppercase L's, we can exclude the possibility that this violation was a result of letter ClEARANCE, as there is plenty of space on both sides of the text. Surprisingly, I couldn't find any information about this on the Fred Meyer FAQs web page, but if you would like to take a role in saving humanity, put down your global warming petitions and leave a comment for Fred Meyer, letting him know how poorly this insane signage reflects on his business. ROFL! That's funny. I made sure to get the Fred Meyer in because I used to work for that company before they fired me for insulting customers' smoking habits at the gas pumps. All of your comments submitted to Fred Meyer seems to have made a difference. 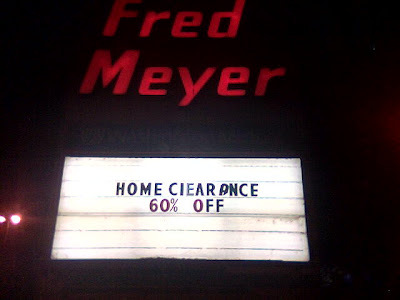 That Fred Meyers hasn't put anything else up on that sign since. It came down days after this was posted so someone must have gotten into trouble. Over a year later and I can report that this sign is still blank. This is strange as it is right next to a highway and has very high traffic visibility.